If you put the German word Multikulti* (translated as ‘multicultural’, though it means much more) into Google Images, the many different representations, interpretations, and applications of the word appear in the humorous montage only the inter-webs can produce. 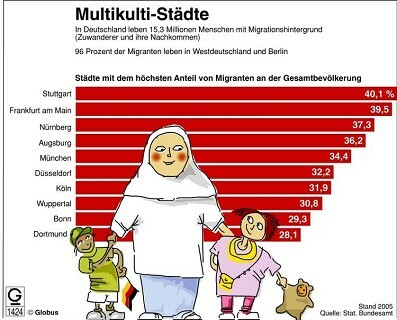 Children with varying skin tones and hair textures playing together, ethnically diverse adults holding hands on a lawn, differently colored chess pieces dotting a globe, or – my favorite – a cartoon depiction of Multikulti individuals against a backdrop of the percentages of Menschen mit Migrationshintergrund, individuals with migration background, in large cities in Germany. A rosy-cheeked Muslim, a brown boy with a German flag, and…a strange child with a large gold necklace? The various meanings of Multikulti are just as ‘multi’ as the differences the word aims to describe. On the streets of Berlin, in the local paper, in the city’s stuffy Metro cars the picture isn’t any clearer. A sign reading “Multikulti party catering” swings from a Senegalese food cart at the Bergmannstraßenfest. Heaps of thickly-sliced fried plantains with Cocktail sauce. “Multikulti in Schöneberg” headlines a newspaper article on real estate development. Dark-haired children frolicking on a sidewalk with no blonde-haired children in sight. “Multikulti shop” describes a place where one can find ‘party hats’ and exotic party favors, as told from an elderly woman on the U-7. “Multikulti has absolutely failed” smeared across the room in the Chancellorin’s speech. Words planted within an integration discourse just learning to deal with real, long-lasting immigration, rather than the comings and goings of guest-workers. In the airwaves of Berlin the word Multikulti is used as one might use “diversity”, even as one might simply say “different” or “differences”. It is sometimes used without comment or value-judgment. It is sometimes used to draw lines in the sand between integration – read assimilation – and segregation – read parallel societies – as if any process were ever so clear and immediate. But when is such a word political and when does it just mean ‘different’? Take the Multikulti breakfast, for example. A “Multikulti breakfast” is eating Vegemite with maple syrup, apparently. Simply put: something a little different from somewhere a little further than Cologne, Munich, or even Rostock, could be Multikulti. I spoke to a friend with whom I study sociocultural anthropology here in Berlin about what the word Multikulti means to him. He is young, German, gay, well-educated, well-traveled, and ‘anthropologically curious’ (i.e. we love to deconstruct words like ‘culture’, making this whole piece quite a challenge in and of itself). He lives in the African Viertel in Wedding (my old stomping grounds) and spends quite a bit of time in Neukölln – the district branded with Multikulti as both claim-to-fame and scandal. Close your eyes and think of Multikulti. Now open them. What do you see? I was hoping that such an exercise would work a little bit like Google Images, assembling a lovely decoupage of different ideas and popular motifs with the speed of a mouse-click. I just think of Multivitaminsaft, multivitamin juice. It just sounds like putting together a bunch of different pieces, then branding the whole jar with a catch-all phrase for society’s use. Do you see Multikulti in Wedding? I ask. Wedding has a high and growing number of non-German residents, in terms of both citizenship and place of birth. No, because it just exists. So, I wouldn’t call it Multikulti per say. It isn’t hyped up yet, like it is in Neukölln. Since everyone is moving to Neukölln, it’s become Multikulti. I also just think of Karneval der Kulturen. Packaged things…Packaged diversity, rather than the real stuff, which doesn’t need external PR. Multikulti: the catch-all black-box term for dealing with difference. Its meaning depends on whose mouth delivers it, which spaces enclose it (or don’t), and in which situation such a word is flung into the public or personal realm. And that is just the tip of the Vegemite-syrup-breakfast sandwich. Understanding Multikulti is situational, buried in context and everyday life. It is a filler word, one to be picked up and laid down in places where our language fails at getting at complexities of urban encounters and differences, at challenging and playful collisions. Before any more political discussions continue as to whether Berlin as a city will “fail” because of its Multikulti character, perhaps we should confirm just exactly what this Multikulti is to us, to voters, to residents, to admirers, to little children appearing in articles for or against a concept they may have never even heard of. This is a concept, Multikulti and multiculturalism, which, as our societies embrace difference as more the norm than the exception, might become irrelevant. *Multikulti is a term in the German language to be found not only in Germany, but in Austria and Switzerland, as well. This piece does not attempt to glorify the practice of “multiculturalism” politically or socially, nor does it seek to provide an operational definition for all uses of the term. Multiculturalism, including the more socially-flexible and popular term of Multikulti particularly in Berlin, will never mean one thing to all people. Multiculturalism is, however, often a matter of policy, making it concrete and important for the lives of many – which begs the question as to the efficacy of shaping society on the basis or in opposition to an elusively undefinable phenomenon. As the above picture illustrates, only through communication between these various poles of whatever Multikulti may be, can policies which are good for everyone be implemented and public discourses celebrating difference passed on. For a comprehensive review of the policy side of Multiculturalism in both the Americas and the European Union, see the Migration Policy Institute’s informative report. What's the best way to explore Berlin's diversity? Good food and good exhibitions, we've told the GoEuro Blog.